James White also authored The King James Only Controversy in 1995. 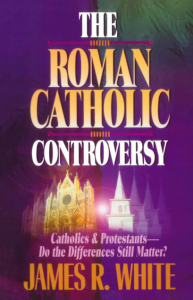 This 1996 “Controversy” book is directed toward the continuing debate over how evangelicals should consider the faith of Roman Catholics. White follows the view that Catholics cannot be considered true believers if they are basing their faith on the Roman Catholic Church’s doctrine. White has spent the last several years debating leading Catholic scholars all across the country over these current issues. He brings first-hand arguments, which the true believer ought to understand, to the light. Many Catholics want to say that their Church has changed from what is used to teach. White spends time documenting the Catholic Church’s statements from Trent to Vatican I and II, showing that their official position is the same as it has always been. As has always been the case, to win a Catholic, you may first have to instruct him on what his own Church believes. The two major doctrines where Catholics have always disagreed with Evangelicals are the authority of the Scriptures alone (sola scriptura) and the efficacy of faith alone (sola fide). It is essential in our day for the believer to know what he believes about these two doctrines. Sometimes we non-Catholics come too close to espousing similar errors to Catholics, especially in the area of authority. It is human nature to seek for authoritative voices even outside of the Bible. This may be in a cult, or a church, a translation or a prophet as long as it provides us with the ability to say, “we’re right because we’re right, that’s all.” The Catholic Church is still saying it loud and clear.